This spring, interiors take their cue from nature. Fortunately, it’s more about cute and cosy than David Attenborough and Dynasties. 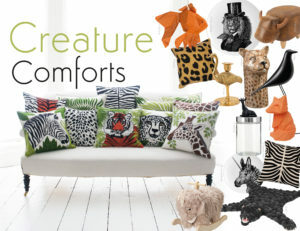 Animal and bird accents can be adapted to suit almost any style, from the elegant cranes found on Japanese silk cushions made from vintage kimono fabrics, to louche leopard skin prints and quirky ceramics to brighten up your breakfast table. Mock-taxidermy, hares, stags and foxes remain popular for a country look, while sloths, llamas and unicorns can be fun for grown-ups too.